I know what you’re thinking… what on earth is iRunFar doing? It isn’t lost on us that reviewing an indoor exercise machine is the farthest thing from exploring the natural beauty that this website’s community lives for. But most of us also know that a treadmill can give us an opportunity to maintain and build fitness when outdoor running isn’t recommended or possible due to weather, life logistics, and more. 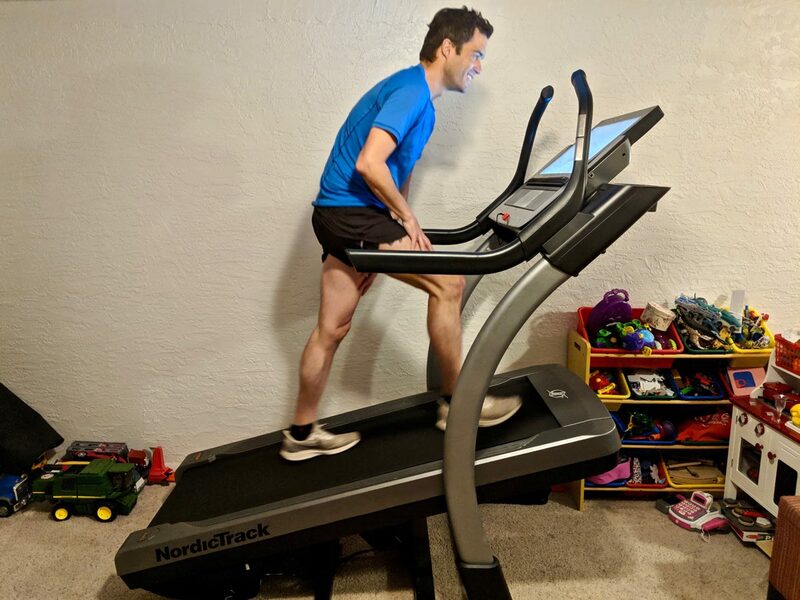 When I was first approached to test the NordicTrack X22i Treadmill ($2,999), I snickered at the idea that I could possibly build mountain-running fitness on a treadmill. My past experiences on treadmills ran the gamut from using incredibly expensive Woodway treadmills in college to being forced inside due to frigid temperatures when I lived in the midwestern United States. It never gelled, and the most I could ever bang out was around eight miles. I felt awkward on the treadmill, and any attempt at fast running made me worry that I’d face plant. The NordicTrack X22i Treadmill is not your normal treadmill, though, and it’s become a useful tool for both regular run training and training for mountain running–especially for mountain-running training. What follows is my experience with the X22i Treadmill over the course of the last year as I trained for both mountain ultramarathons and a road marathon. I’ll discuss what I’ve enjoyed about this treadmill in particular as a training tool, and I also have some criticisms for some of its shortcomings. Additionally, I reached out to professional ultrarunner Kyle Pietari to discuss his experiences with the treadmill over the past few years and how he incorporates this tool into his busy life and training. I can honestly say that running on the NordicTrack X22i Treadmill is the first time I’ve enjoyed training on a treadmill. Its wide and long belt (22 inches x 60 inches) feels secure, even while doing things like strides at 5:00/mile pace, and NordicTrack’s Reflex Cushioning technology means that I end workouts feeling less beat up than I would if I had done the workout on the roads. The treadmill itself is large and feels solid all around. It shakes very little, even when I’m running at a high incline, and I haven’t experienced any durability issues in a year of consistent use. Did I mention that it goes up to a 40% incline? Let’s talk about this incline a bit, because it’s no joke and it’s what makes this treadmill a real tool for mountain runners. In fact, at 40% I can barely stay on the treadmill at a hiking pace without using the sidebars for balance. However, the fact that you can train at such ridiculous inclines is really valuable and translates well to hiking up the steeps in races. The treadmill’s decline goes to a much more normal -6%. Another feature that sets this treadmill apart from others is the ability to select specific speeds and inclines with the push of a button. On the right side of the console are 12 buttons for speed, one to 12, and if I want to run 8:00/mile pace I just hit the ‘7’ button followed by the ‘5’ button for 7.5 miles per hour. This works great on the fly and the treadmill’s speed ratchets up and down more quickly than other treadmills I’ve tried, making intervals a bit more real feeling. On the left side of the console are 12 more buttons to select your incline and decline, everything from -6% up to the dreaded 40%. Although there are also the typical up-and-down arrow buttons to change the speed and incline, being able to press a button once to go up to 10% is really quick and convenient. The touch screen allows one to toggle through various settings in manual mode to see pretty customized data including total ascent, distance, time, pace, heart rate, and more. I was thankful for the dual fans at the bottom of the console that I’ve used for every single run. They actually work and I haven’t managed to short any of the electronics out with excessive sweating. NordicTrack makes four models of basically the same treadmill, but with different-size touchscreens. The X22i, the model I tested, has a 22-inch screen. The smallest screen, on the X11i, is 10 inches, and the largest screen on the X32i is, perhaps you guessed it, 32 inches. You probably can also guess that the models get much more expensive as the screens get larger. Okay, let’s start with the screen upon which you interact with the treadmill’s software. The 22-inch screen on the model I tested was absolutely beautiful with a clear picture and snazzy graphics. The first thing you do when you’re programming the treadmill is to connect it to wifi, but, for whatever reason, NordicTrack did not include a web browser! So, don’t plan on streaming or even accessing YouTube. At first this seemed incredulous, so I called NordicTrack last year and customer service told me that this update had not come out yet. If NordicTrack did include a web browser this would be a huge upgrade, as the high-quality touchscreen and speakers do provide a nice viewing experience. NordicTrack’s proprietary software is called iFit and is touted as an ‘all-in-one’ coaching service. For a $15/month subscription, you can access studio classes, virtual coaching, and destination workouts. I explored some of the free guided runs, including a three-mile jaunt through some of Silverton, Colorado’s trails, and as I ran the treadmill changed grade quite quickly on the rolling trail. It is fun to be able to look at actual scenery of the beautiful trail, however, the whole experience seems a bit wonky as the scenery does not stream past, but rather provides screenshot-style Google images. While NordicTrack clearly believes that users are in the market for ‘professional trainers’ and ‘personalized’ run training, I never found the urge to pay for the iFit service to be able to access the 16,000 on-demand workouts. Instead, I used the treadmill in manual mode and did my normal training. iFit also has an app that pairs with the treadmill to see your training data. I found this app fairly useless as it doesn’t communicate with any popular training logs such as Strava. If I wanted to upload a workout from iFit to Strava, it involved downloading and converting a file and then uploading it to Strava. The treadmill also comes with an iFit heart-rate monitor that works very well as far as immediately picking up my heart rate when putting it on and it seems very accurate in tracking quick increases and decreases in my heart rate during intervals. Unfortunately, I’ve had major issues with the iFit heart-rate strap which, for whatever reason, seems to cut into my skin a bit and has left some welts. I’ve tried putting various lubes on the chest strap, but this keeps happening. It could be completely particular to my body, but I don’t have this issue with my Suunto chest strap and I think the fabric of the iFit strap is more abrasive. I started training on the NordicTrack X22i Treadmill last February while training for a 100k race with about 16,000 feet of climbing. Starting with little mountain fitness, I practiced getting my legs under me by jacking the incline up above 20% and trying to maintain a little over three miles per hour. I was amazed at how my pulse shot up to 160 beats per minute and I was able to build mountain legs, all while my kids played on the floor next to me. Since then, the NordicTrack X22i Treadmill has really helped me keep my training consistent. After a long day at work and facing a run in the cold and darkness where I live in Colorado, the ability to just throw on shorts and shoes and feel like I’m doing some parenting means that I’m much less likely to bail on the run. This has been the case this winter as I’ve been training for a marathon. With slick conditions and frigid temperatures in the mornings, I’ve moved most of my speed workouts to the treadmill. Despite Jack Daniels’s treadmill-conversion formula, I find that fast paces on the treadmill are actually quite difficult for me, but those paces transfer with ease once I get outside. If you’re struggling with balance in your family, work, and running, this treadmill can be a valuable tool that has really acted as a reason to not skip runs when I’m struggling with going out in the dark. While the retail price may seem daunting, NordicTrack offers 0% financing options so you don’t have drop $3,000 all at once. If per chance you follow the ultra-consistent ultrarunner Kyle Pietari, then you know that treadmill training is common practice for him. His social media shows several photos of him literally wearing two of his children while hiking on his NordicTrack x11i Treadmill. As a competitive ultrarunner, Kyle has been involved with NordicTrack. 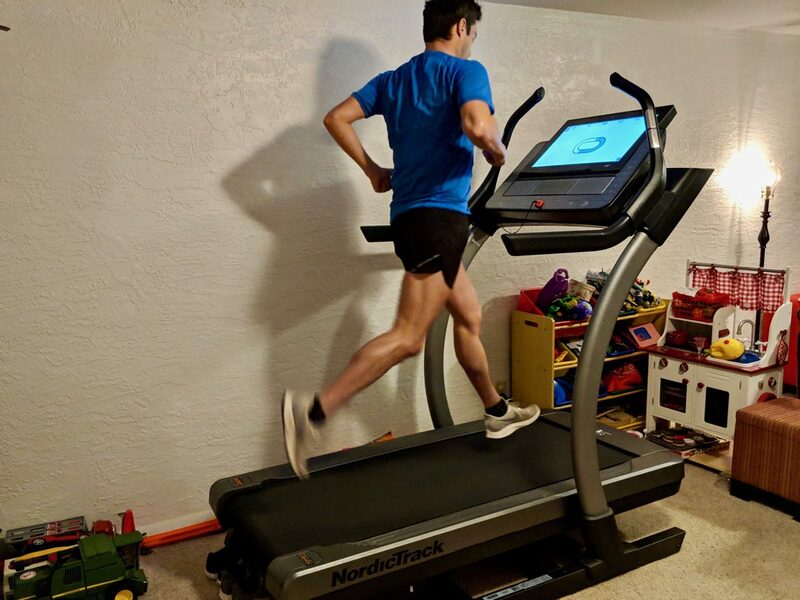 Kyle received an X11i Treadmill from NordicTrack in 2017 in exchange for his honest and unbiased feedback. As previously mentioned, the X11i is in the same incline-trainer group of treadmills at the X22i reviewed in this article, but it has a smaller touch screen. I reached out to Kyle to get his thoughts about training on the X11i and to assess the durability of this hefty investment. “I’ve had my X11i Treadmill for nearly two years. The hardware has always seemed well built, and provides a great feel. I’ve had no issues with the hardware,” he said. 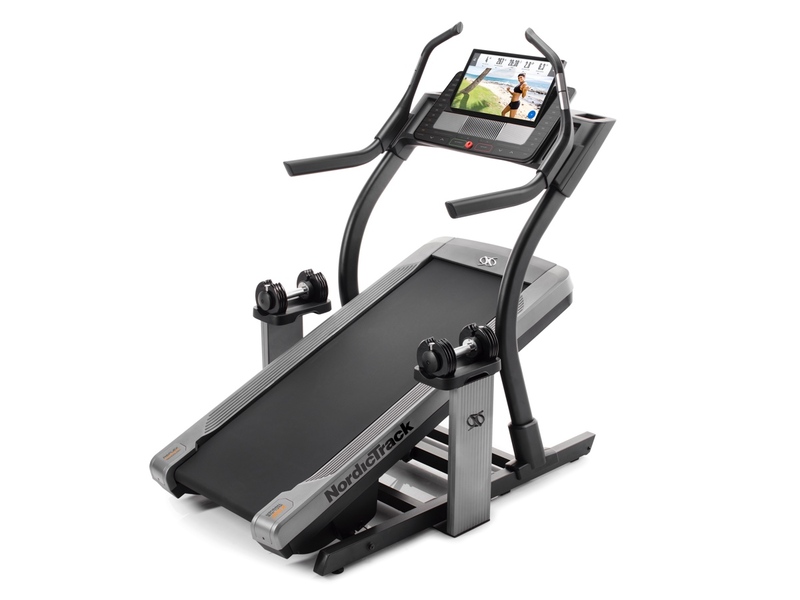 Have you run on any of NordicTrack’s incline-trainer treadmills, such as the X22i? If so, what are your overall impressions on the experience of running on them? 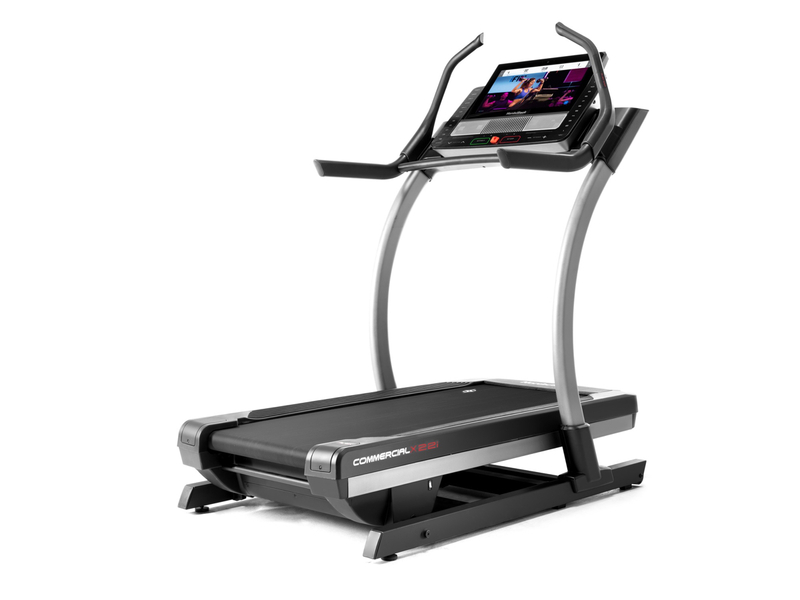 And how about the treadmill’s specific features, such as its incline and decline, belt, screen, iFit software, and more? How have all these specific parts of the treadmill performed for you? What is the weight of the treadmill? I’m having difficulty finding a weight in the tech specs. User weight capacity is 350 lbs, but I don’t think thats what you’re looking for. It is a heavy machine, and this would be good to know if putting it upstairs or on a main floor with a basement underneath. I will keep looking! We just heard from the manufacturer that the treadmill weight is about 310 pounds. Hope that helps! Nice review. I am in the market for a new treadmill and this one looks like it would hit the sweet spot for me since trying to do mountain training in Southern Maryland is tough. ZWIFT does look interesting, and I have friends that enjoy it for indoor cycling. It would be interesting to run a speed workout with a friend on the other side of the continent and be able to push eachother. Another trend that seems to be in its infancy are treadmill studios, like Thoroughbred in SF. I think there are only a couple in the country and I wonder if they’ll take off the way spin classes have. Again, something I could see doing for a difficult workout rather than a casual run. Nothing beats the trails, but the Incline Trainer will help you get mountain fit in Maryland. hiking 30 degree inclines that never end is a sweat fest! Awesome, Tom! I’ve wondered about the stability of the higher incline NordicTrack TMs. Its pretty rock solid, and now when I run on commercial treadmills at work or my wife’s gym they feel a bit unstable. Again, first treadmill I’ve ever felt okay running intervals on outside of a $15,000 Woodway. I’m happy to answer questions if anyone has any for me, specifically (publicly or privately). I bought an x7i back in 2012. It was an excellent training tool for mountain ultras (when it worked) and the mechanical build was really solid. Unfortunately, in the first 6 months several electronic components had to get changed out. I got an extended warranty for it after the factory warranty ran out because those components as well as a couple others failed over that time. Several more components (all electrical) failed during the extended warranty and were replaced. However, I had to install them as the extended warranty didn’t cover labor. The warranty ran out last year, with no opportunity to extend from NordicTrack and the motor control unit failed for the second time. The whole experience was a real turnoff for icon/NordicTrack products. It sounds like you’ve had the treadmill for over a year and haven’t dealt with any of the same problems. Is that accurate? James, I had the same mill, same timeline, same failures. I sent mine back after 3 problems. I bought an x11i Commercial this winter. Rock solid, no issues, great mill. The ifit stuff is gimmicky to me. Just set that hill on manual and suffer. I have the x11i and structurally I like the treadmill but have had significant problems with the software. Using the “Create My Run” feature with the map is very cool in theory, but extremely clunky. It constantly unfollows the route and stops undulating up and down with the vert, forcing me to have to select a button to “re follow” the route. Happens frequently and is annoying. Also am not a fan of the decline. At a given decline the treadmill will slow down to 6mph. On the “map my run” feature, if the course drops down to 6% decline, it will slow you down to 6mph and not return you to your previous speed once the grade stabilizes to level or back to an incline, forcing you to manually change. On a rolling hill course, this is a pain as you constantly have to be engaged to reset your speed. Have you had this problem? Overall impressions, treadmill is quality but iFit is problematic. It is great for a sales pitch but if you are any kind of a serious runner, I think you’ll find iFit extremely lacking. I wish it were wider. Nearly all treadmills are 20 or 22 in wide – not quite wide enough to use trekking poles. You need a treadmill that is at least 26 inches wide to use trekking poles – this jumps the cost well over $10,000, still – Woodway and Tuff Treadmill (among others) do manufacture them. Just got one of these for my classroom – have students “climbing” Everest (and love training on it myself). The one thing I’d love to “fix” about it is that at the -6% the maximum speed is only 6 mph. Do you know how to override this feature? I’d love to get some higher-intensity downhill running in every so often.